As we saw in part 1, by the mid-20th century Ornati and Garimberti were the most respected makers active in Milan. The two were lifelong acquaintances and competitors and their work is stylistically very similar – yet although Ornati no doubt influenced his younger colleague, he was never Garimberti’s mentor. Ornati stayed with Bisiach for some years, unlike Sgarabotto, who had left the workshop by 1905. In his personal work Ornati adopted his employer’s style and continued using Bisiach’s models. Many of the better Bisiach instruments prior to World War I bear Ornati’s excellent hand. Sometime after 1910 Ornati created his own model. He never engaged in exact copying of either Stradivari or Amati. Rather his instruments are an eclectic and simplified tribute to the Amati school – unusually, he chose to avoid Stradivari’s golden period models. His early works are rare but after 1920, having made some technical improvements to his model, Ornati began to construct more prolifically, with his workmanship reaching its peak during the middle of the 1920s; it did not substantially decline during the rest of his career. 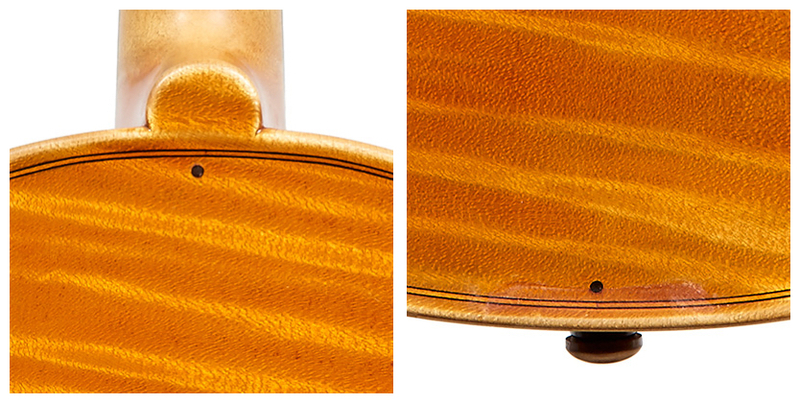 Particularly characteristic are Ornati’s soundholes, which are carved with the utmost care and precision. 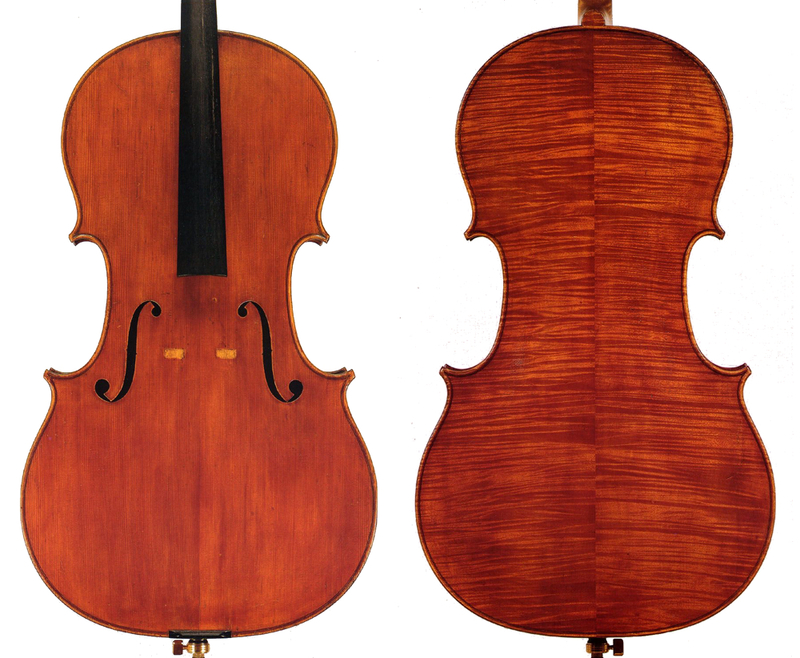 They are often further apart and more slanted than one would expect from an Amati bench copy or even the Bisiach Amati models from the later years. 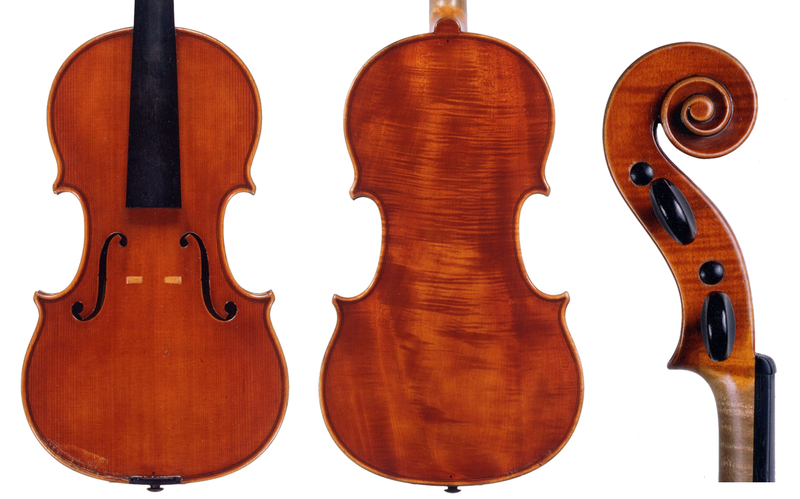 Ornati avoided the Guarneri ‘del Gesù’ model, while the Guadagnini-modeled soundholes seen on a few of his instruments are ‘scholastic’ and miss the point of Guadagnini’s unique style. Despite the extreme precision of his hand, Ornati worked with great freedom, leaving one to wonder how he managed to achieve such refinement while preserving the spontaneity we associate with the classical-period Italian luthiers. The dark ebony and light-colored maple purfling, with the dark strips significantly wider than the white, is harmonious and extremely carefully inlaid; it is never too narrow, nor does it show any faults or breaks. The edges, generally not too deep, are perfectly round, balancing the elegantly carved corners that are never too square. The roundness of the bouts, in turn, balances the smoothly chamfered scroll. The soft, oil-based varnish, tending toward a warm reddish-orange, is plentifully applied onto a lighter ground, intensifying the wood’s inherent beauty. 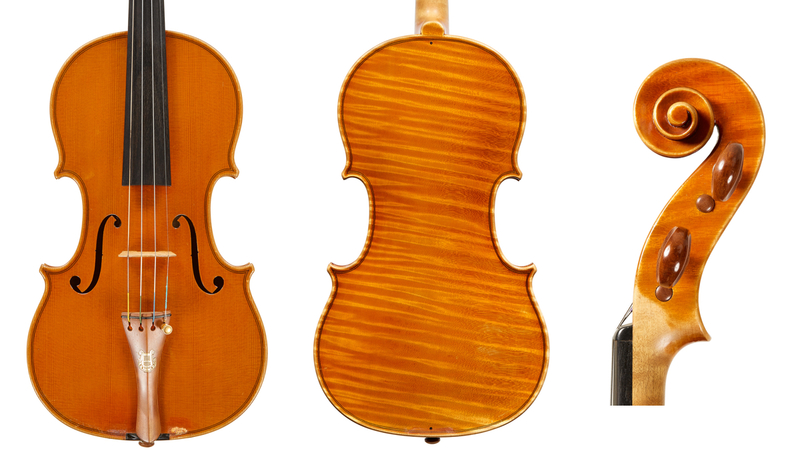 The well-proportioned, smooth and round scrolls are invariably of the Stradivari model but with more open throats. From about 1923 Ornati frequently made use of large, round ebony locating pins for the backs, similar to those used by Pedrazzini. These are positioned quite close to the purfling, though often the top and bottom pins do not match in their distance from it. These pins are characteristically almost too dark and large for the eye, especially when, from the mid-1930s on, they are often placed right in the middle of the upper and lower purfling extremities. Ornati’s fine personally made instruments are far rarer than those of his contemporaries, presumably because he spent a large part of his time making instruments for Bisiach and, later, executing repairs. In the 1930s he became the official violin maker for Milan’s La Scala theater, a position that no doubt involved much set-up and repair work. Many of his bridges can to this day be seen on other instruments, both classical and modern. However, Ornati’s skill allowed him to produce work of great finesse late into his career. Exceedingly well-made instruments exist from the late 1950s, when he was in his early 70s – never quite succumbing to the roughness or commercialism associated with even the best violin makers, who in their later years often employed less skilful apprentices. Ornati used two different labels during his career and from the 1920s he introduced a brand, which he normally placed above the label and in other areas inside his instruments. The labels are always signed with his beautiful, ornate signature, which has defeated those attempting to fake it; the capital ‘O’ appears to incorporate the treble clef. Some instruments also bear Ornati’s signature on the interior. While 19th-century makers often listed their awards on their labels, the younger generation generally omitted them. Ornati and Garimberti were good examples of highly decorated makers who avoided mentioning their awards. Ornati constructed no more than 20 cellos, the majority of which were made for Bisiach, and a much smaller number of violas, his violins being far more numerous. The cellos are based on a more Stradivarian model than his violins. Garimberti was the final representative of the Antoniazzi–Bisiach school, with excellent and personally made instruments dating from as late as the late 1970s, when the maker was approaching his mid-80s. Like Ornati, he was one of the very few makers who during their final years were unafraid of the bench, continuing to work unassisted. 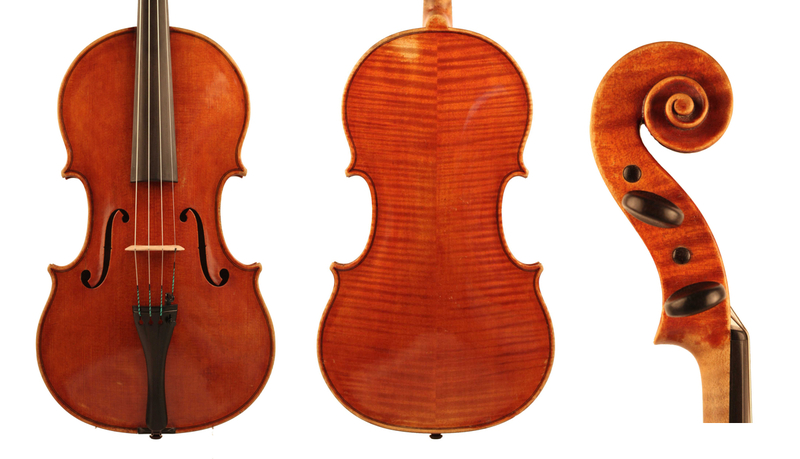 Garimberti learned the rudiments of violin making from Romeo Antoniazzi and Pedrazzini, but stylistically his work is much closer to that of Ornati. During their mature periods these makers’ style is so similar in beauty and execution that one wonders whether they consciously challenged each other to achieve such heights. Their technical ease did not fall victim to the mundane sterility often associated with the excessively clean making of some of their contemporaries, especially the makers who had trained rigorously in Mirecourt and Mittenwald. 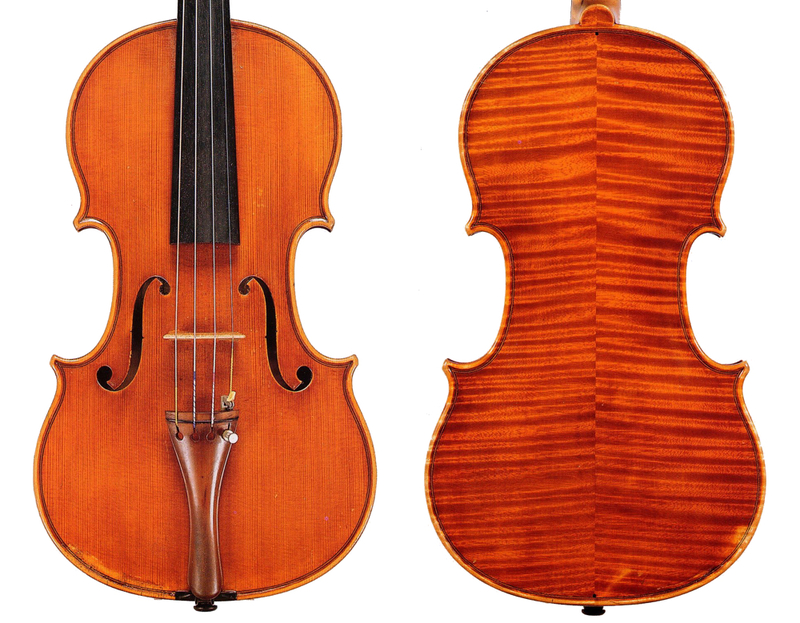 Despite their similarities, there are some differences in their work: while Ornati’s violin form is soft and flowing, with widely placed and slightly slanted f-holes, Garimberti used a variation of the more masculine Stradivari model, with more upright f-holes that have a characteristic sharpness at the extremities. In his early work Garimberti omitted the use of pins in the back and adopted small, Amati-type locating back pins in his mature work, although intermittently so especially after the 1950s, while Ornati used no pins in his early work and consistently used far larger pins during his mature period. 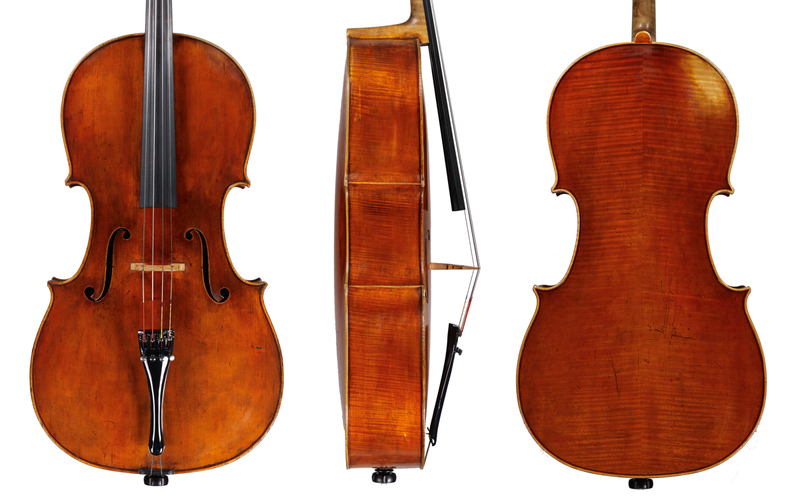 Garimberti’s back buttons are substantially wider than those of Ornati, and the purfling of his instruments from the 1920s and the early 1930s is often unusually wide, with black strips that are not as dark or quite as perfectly executed as those of Ornati. In his early work Garimberti had a definite preference for highly figured, one-piece, slab-cut backs, but later equally adopted prettily wooded two-piece backs. While Ornati’s making was quite consistent throughout his career, Garimberti’s mature work differs from his early instruments. The most conspicuous changes may be observed in the post World War II instruments. In many ways it is these instruments that are the closest to those of Ornati. The purfling is narrower and better controlled than his earlier work, and the edge channelling is more pronounced. However, the f-holes gain in angularity at the top wings and the more quickly executed but perfectly round scrolls appear more rudimentary than in his earlier work. From 1927 to the late 1930s Garimberi won at least three important prizes in national competitions, including a first prize for a cello at the 1937 Stradivari Bicentenary in Cremona. Garimberti made a decent number of good-sized violas – in particular during the second half of his nearly 60-year career. He was much more prolific than Ornati as he worked on his own for at least eight years longer and probably executed far fewer repairs. With thanks to Giorgio Grisales.